OK. I see now why everyone loves Noro ! 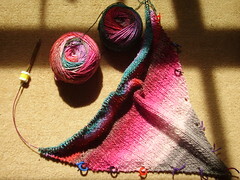 This is silk garden lite and I have to decide whether I'm going to need another skein to complete this clapotis. I've tried applying the 'rule of 5' but still feel unsure. considering how much fun the actual circle part of this was to knit, the arms have taken me a disproportionate amount of time to complete. I'm blaming it partly on the fact I've actually got some work done in the past week or two, partly on attempting to be sociable while having visitors to stay and partly to being under the weather and not feeling more in the mood for a nap than a knit. But I do love it. 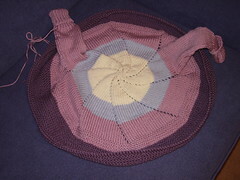 The yarn is so soft (Debbie Bliss Cashmerino Aran and Rowan Aran) that the whole cardi seems almost shiny with cuddliness. 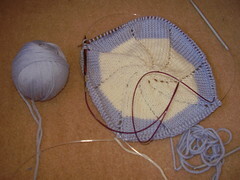 On the knitting front, pinwheel is coming along nicely but I didn't get a chance to knit for over 24 hours yesterday because of a trip to Leeds for the Medieval Congress. I gave my paper, my powerpoint worked properly and got to speak to some of the historians from Cambridge. Quite why we only ever have chance to chat when we're in Leeds is one of those perennial questions, probably doomed never to be answered. 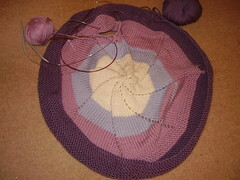 Yesterday I started a Pinwheel sweater in aran. It's a chance to try out my new Knit Picks Harmony needles. I'm using 3x5mm circular needles for this ; I don't own any DPNs but happen to have three 5mm circs so it made sense to use all three. 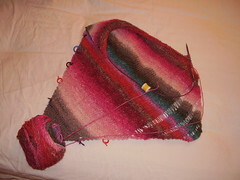 I love the pattern so far; it's like instant gratification because it looks pretty so quickly! !